G Loomis is known worldwide for making handcrafted, top of the line fishing rods. Their rods are made in the United States and are built by hand in small batches. G Loomis incorporates the latest technology into their fishing rods and anglers love them. 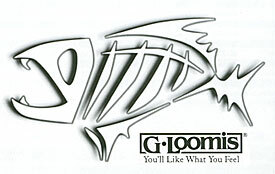 If you are a fan of quality and want to fish with a rod that seems like it was made just for you, then give a G Loomis a try. You won't be disappointed! G Loomis also recently started making fishing gear including t-shirts, hats and sweatshirts.